Promoting positive attitudes towards good health and fitness in primary school children. Sean Murdoch and Lewis Martin at St John`s PS, Rosyth. 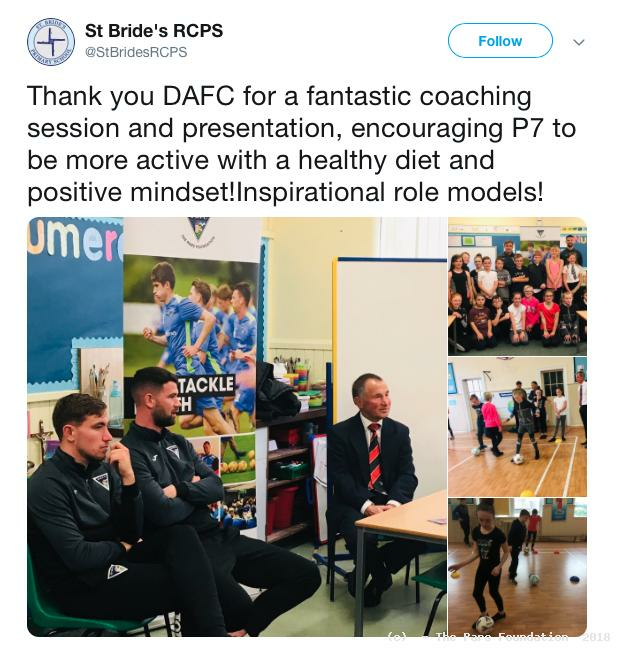 The ‘Pars Tackle Health’ programme aims to promote positive attitudes towards good health and fitness in primary school children, using professional footballers as role models. It helps to consolidate the Learning Outcomes covered in Health & Wellbeing, throughout their Primary School education. Two DAFC players and a coach from the Pars Foundation visit each participating primary school, accompanied by former schoolteachers, Gennaro Giudice and Sandy Wyse who coordinate the workshops and introduces the players. Lee Ashcroft and Danny Devine with P6s at Commercial PS. 1. Players describe a typical day in the life of a professional footballer, stressing the importance of a healthy diet, of drinking lots of water and of getting plenty of rest and sleep, as well as the benefits of regular physical exercise on health and wellbeing. A DVD may be used to show the players going through their daily training routines. The players also describe their match day preparations. 2. Q&A session, in which pupils are given the opportunity to ask the players questions relating to football and/or health and fitness. 3. Players and coach then take the class for a practical session, either in a games hall or outdoors. Players may demonstrate skills, which pupils can copy and practise, finishing with a small-sided game of football. 5. Evaluation forms, to be completed and returned to DAFC, are issued to the class and their teacher. 6. Resources for follow up work are sent to the class teacher, immediately after the visit. » Diet – healthy eating is important as it produces positive benefits throughout life. » Physical Fitness – regular exercise is beneficial to all aspects of health and wellbeing. » Teamwork – learning to work constructively with others is an important life skill. » Motivation – the development of desire and focus is the key to success in any arena. `As always, the visit was well organised and the lesson content was appropriate, with a good balance of listening and practical activities. The children were very engaged and motivated throughout the session. The video link was excellent - not too long but delivered the message. The children really enjoyed the practical session which was well organised and skills taught were appropriate. Danny and Lee were friendly and interacted well with the children, answering all their questions clearly and honestly. It was great to have the players in person. Our children were enthused to hear about the daily life of a professional footballer. The session was well prepared with pre and post-workshop tasks. The video clip was great for discussion prompts and gave a good insight into the players’ training routine. The players gave very honest responses in the Q&A session and interacted really well with the children. The games session featured a great warm up that engaged the learners. All in all, a very positive experience which we hope to continue with the Pars for many years to come. We knew about the Pars Tackle Health visit well in advance and received detailed information about its content and ideas to prepare our children for it. Our pupils were very engaged and enthusiastic during the player talk. Those who sometimes struggle to listen for long periods were noticeably more engaged than usual. The video clip was very engaging and gave a great insight into a professional footballer’s daily routine. The children really enjoyed the games session and the players responded brilliantly to them. The entire session was very engaging for our children. They loved finding out more about the daily routines of footballers and having the opportunity to play football with them. They are all also very excited about their free tickets. Thank you for coming to Lynburn, It is something that the children will be talking about for a long time! The Pars Tackle Health afternoon was excellent from start to finish. The visit was well prepared and very informed. The player talk was brilliant and both Lee and Lewis answered all the children’s questions really well and very honestly, with lots of detail. The games session was fantastic and the highlight of the visit for most of our pupils. They were also delighted to receive a complimentary ticket for the next home match and are very excited at the prospect of visiting East End Park. As always, a super session, very informative and with great links to our health curriculum. The children really enjoyed the Pars visit and learned a great deal about fitness and healthy living. Enclosed are some thank you letters to show their appreciation. Many thanks. The player talk was very good and the children were fully engaged. The children’s questions were well answered at an appropriate level. The children loved the games session and were excited with the autographs and photo opportunity. The player talk was interesting and engaging. There was good interaction from pupils with staff and players. The children were really interested in the players’ answers to their questions which were very relevant to all aspects of health and wellbeing. The children really enjoyed the practical session but would have liked more time for it. Thank you for visiting our school and giving us the chance to take part in the Pars Tackle Health programme. You inspired us to be confident and never give up on our dreams. The games we played were great fun and helped us to improve our football skills. John Potter`s story was very inspiring. It`s brilliant that he comes from our village and went to our school. At the end of his playing career, he stayed with the Pars as a coach and now helps young players to become better footballers. It is good to have aspirations for our health, fitness and future. I am going to eat more healthy and become more active from now on. St Serf`s PS, High Valleyfield. I really enjoyed hearing about the life of a pro footballer and what food they eat to stay healthy.